Sited high on a rocky outcrop, Smailholm is a well preserved 15th century rectangular tower set within a stone barmkin wall. 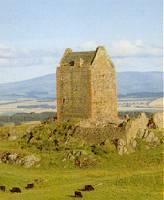 Inside the tower is a model of this Pringle residence and a charming collection of costume figures and tapestries relating to Sir Walter Scott's "Minstrelsy of the Scottish Borders". It was the sight of Smailholm which fired Walter Scott's imagination when, as a young boy, he was brought up by his grandparents at the nearby farm of Sandyknowe. Near Smailholm village, six miles north west of Kelso on B6937.